Neotropical darners (genus Rhionaeschna) include five North American species, three of which – Arroyo, Blue-eyed, and Turquoise-tipped Darners – are found in Arizona. The genus is typified by the presence of a small tubercle, present in both sexes, under the first abdominal segment – see picture. All Neotropical darners (genus Rhionaeshna) have a small tubercle under the first abdominal segment. The Turquoise-tipped Darner (R. psilus) differs sufficiently in size (smaller) and coloration from the other two species that its identification normally poses no problem. 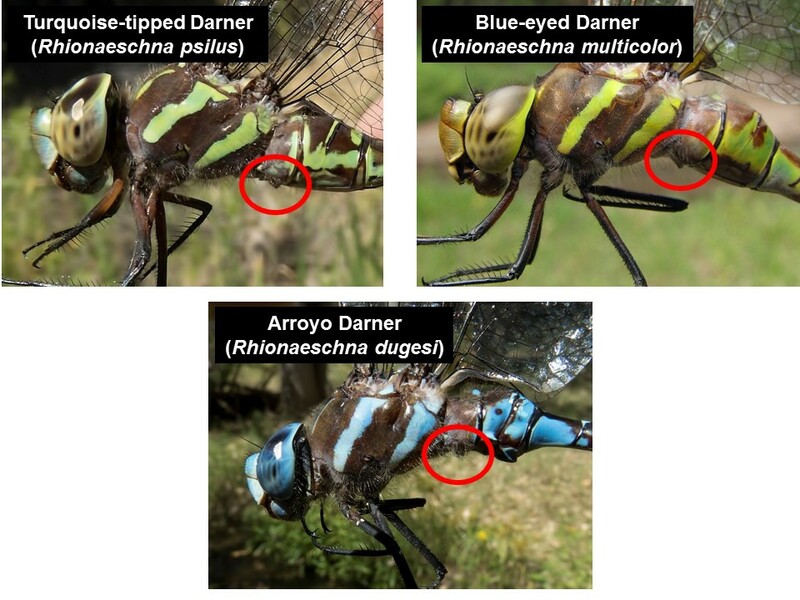 However, the Blue-eyed (R. multicolor) and Arroyo (R. dugesi) Darners are quite similar. The Blue-eyed Darner is generally more common than the Arroyo Darner and is found throughout Arizona and neighboring states whereas the Arroyo Darner has been recorded only in the southeast corner of the state. Adding to the difficulty of identifying the two species, however, they occupy partly overlapping habitats and both can in fact be found flying at a same site. Arroyo Darner: anterior stripe has a rearward-pointing extension. Arroyo Darner: upper appendages not forked. 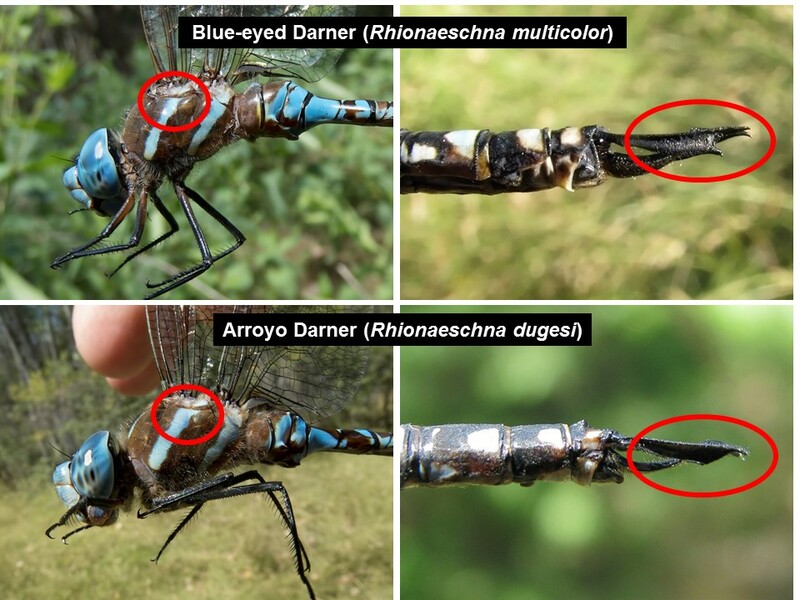 Comparison of the shape of thoracic stripes and appendages in male Blue-eyed and Arroyo Darners.